The tortellini is a first dish of stuffed pasta, typical of the holidays meals and, in particular, of Christmas. They are prepared and served in the restaurants and homes of all the Bologna's territory, where nowadays you can find them at any time of the year and every day of the week. The tradition wants that this dish of pasta filled with meat should be strictly served in a broth. A version of the recipe has been filed and recorded by the Accademia della cucina (kitchen Academy), but every family and chef have their own version with possible variations. The recipe reported is that of a pensioner of Crevalcore, Ivana Setti, who tells about her kitchen experiences in the blog titled "Cucinario di nonna Ivana". The meat can be worked a minute in a pan with a bit of butter with and a sprig of rosemary. Then you cut the meat in regular shape not too big in order to crushing it in food processor. The filling must stand for a day. A pinch of it is enough to fill the tortellini in their classic, ring or navel, shape. Mix the wheat flour with the eggs (you can also utilize the mixer). The dough should be removed from the robot when it twists on itself, you work it a bit with your hands and you leave it at least for half an hour under a bowl or in a plastic bag. The dough must be rolled very thin and to do it you can also use the machine. 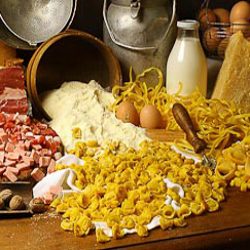 The tortellini must be cooked in a broth prepared with a mix of meats. The broth should be filtered and degreased once it has cooled if you see emerge a lot of fat on the surface. The local gourmets beleive that the real tortellino can be taste rigourously as a soup.